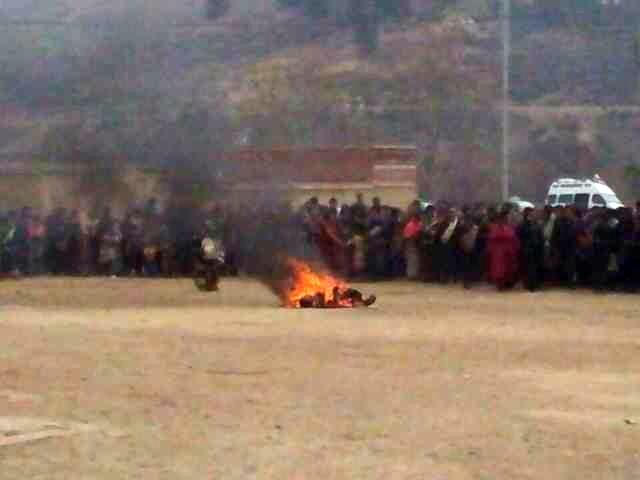 Info: On February 25, 2013, a monk called Sangdag set fire to himself around 10:00am on a road which is to the south of Ngaba town. Sangdag was from Dowa village in Drotsig Shang, Ngaba Dzong, Ngaba prefecture in Sichuan province and was a monk from the Diphu monastery (Sakya school) in Ngaba Dzong. Tsezung Kyab, near Shitsang Monastery in Luchu region of eastern Tibet on February 25th, at the same spot where his cousin, Pema Dorjee, passed away on December 8 2012. 'Peace is like air. Once it is gone, you can not breathe' the same applies to freedom. DHARAMSHALA, February 26: In confirmed reports coming out of Tibet, a monk set himself on fire yesterday in Ngaba region of eastern Tibet in protest against China’s continued occupation of Tibet. 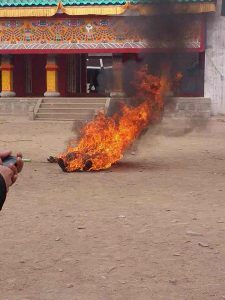 Sangdag, a monk of the Dhiphu Monastery, set himself ablaze on a main road in Ngaba district at around 10 am (local time). According to the exile base of Kirti Monastery in Dharamshala, Sangdag’s present condition is unknown. The release added that details of Sangdag’s self-immolation protest and his current condition and whereabouts are not available. 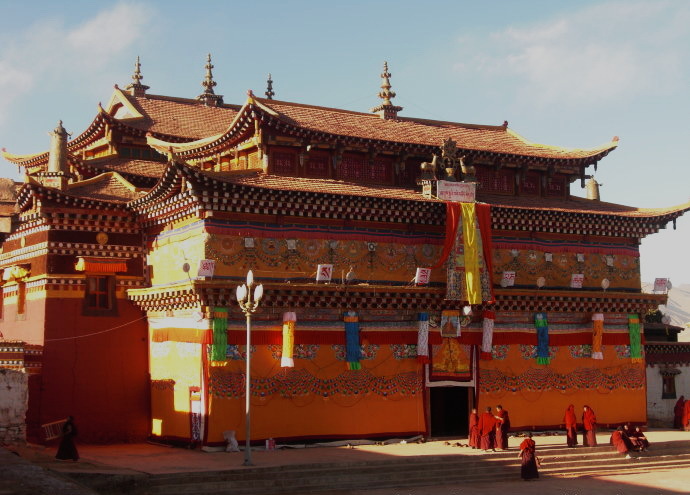 The Dhiphu Gon Gelek Terzoe Ling Monastery, founded by Dhiphu Choeje, currently has around 500 monks. 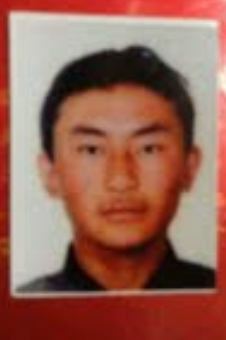 Also yesterday, another Tibetan, Tsezung Kyab, 27, passed away in his self-immolation protest in front of the Shitsang Monastery in Luchu region of eastern Tibet. The large number of Tibetans who were taking part in religious rituals at the Monastery surrounded Tsezung Kyab’s body and rescued it from falling into the hands of Chinese security personnel. Since 2009, as many as 107 known Tibetans living under China’s rule have self-immolated demanding the return of Tibetan spiritual leader His Holiness the Dalai Lama from exile and freedom in Tibet. 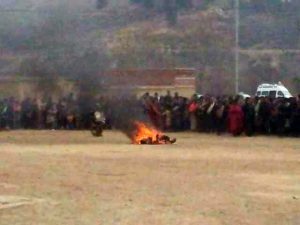 11 Tibetans have self-immolated since the beginning of this year with eight of those fiery protests occurring in February. Last month, the Tibet Policy Institute, a think tank affiliated with the exile Tibetan administration in a white paper on the crisis in Tibet noted that the self-immolations were a "stark judgment of Chinese rule in Tibet." The report titled, Why Tibet is Burning? said China’s policies of political repression, cultural assimilation, social discrimination, environment destruction, economic marginalisation were the principle reasons for Tibet’s fiery protests.